There was no Saaddu clay.. Chaitra and Rajesh (Recycle Karo) helped us with the whereabouts .. Its in Kalyan.. 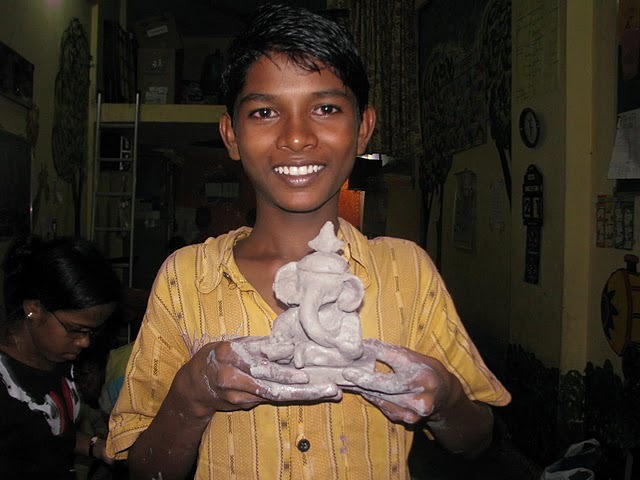 He immediately picked up some of our elder n smart children - Maruti, Simran, Sunita and Reshma for making the lumps of the clay ... I still remember, when Gowarikar Sir threw the question - Ghar pe roti kaun banaataa hai ?? Almost all hands went into the air... :-) We looked and smiled at each other !! "Both brothers were asked by their father Lord Shiva to encircle the entire world.. What all comes in the world? " "Mumbai, Pune, Aurangabad, UP, Kashmir, Nanded, ..."
"ek haath mein laddu...doosre haath mein kya hoga ??" Maruti gave the right answer -- "Aashirwad denge..."
"V shaped legs.. L shaped hands... and so on..."
But Reshma and Dipesh really did well !! "Sir, mera ddekho... teacher yeh barabar hai kya ? Sir, yeh nahin aataa hai...Teacher,yeh plz kaaan banaake do naa ......"